I first wrote this post when the news of gluten free Hobnobs was announced but I now have some very exciting news for you….. THEY’RE HERE!! You can read my original post below, but I wanted to update this with a little review so you know what gluten free Hobnobs are like, and where you can get your hands on them! The gluten free Hobnobs and chocolate Hobnobs can be found in Tesco and Waitrose, and they packaged in a box rather than a plastic wrap. Some people have reported finding them in the ‘normal’ biscuit aisle, but I found these on Tesco’s free from shelves. They are a bit more expensive (shock) than normal Hobnobs and they only come in packs of eight for the chocolate ones, and 10 for the non-chocolate variety. Question: But how do they taste? I bought the chocolate variety, which have a milk-chocolate dip on the bottom. They look a bit less ‘nobbly’ than I remember normal ones being – but then I haven’t had one in about 15 years! Oh, but that taste. As soon as I had one it all came flooding back. Steve said they taste pretty similar to normal Hobnobs and eating them reminded me of being a child again, before being diagnosed with coeliac disease. And the best news? They even passed the dunk test! If you can, they are worth it for the nostalgia and while I find gluten free biscuits too expensive to buy on a regular basis, I think these will fill a hole for those people who really miss them! 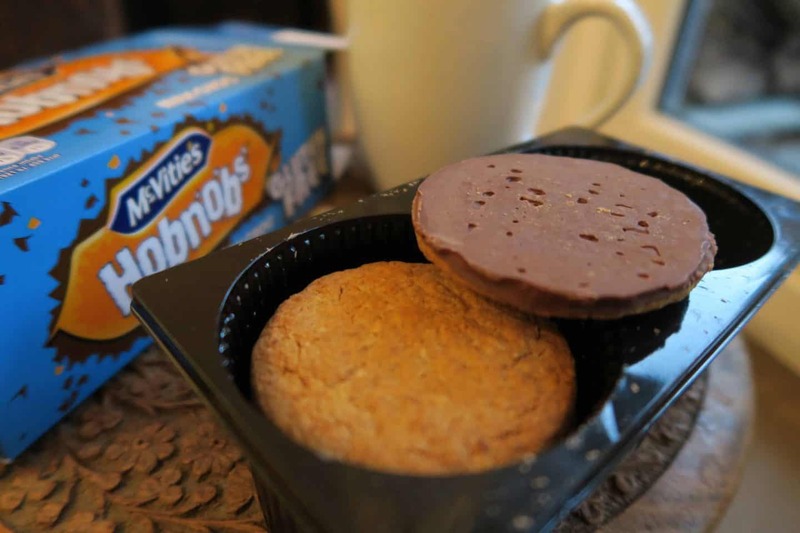 Unless you’ve been hiding in a cave today you might have heard the buzz on social media that biscuit giants McVitie’s has announced it will be launching gluten free hobnobs. Not only this…. but milk chocolate ones too. These gluten free variations of the popular biscuits I used to dunk into my tea pre-coeliac days are set to hit the supermarket shelves in early July, and it would seem the coeliac world is drunk with excitement. According to a press release issued on McVitie’s behalf today, the high proportion of ‘natually gluten free oats’ in McVitie’s has allowed the recipe to be converted ‘without compromise’. This sounds promising – but are they going to be coeliac friendly? Many people with coeliac disease can’t eat oats due to the cross contamination, so I wonder if this is an attempt to jump on the gluten free train (it’s getting rather full) or whether it’s actually to make life a bit easier for people with coeliac. Call me cynical, but I am yet to decide. Kerry Owens, McVitie’s brand director at United Biscuits, says: “The free-from sweet biscuit segment is one that continues to expand, with 55 per cent of UK consumers now open to buying gluten-free products. “As the market leader in the main biscuit aisle, free-from is an important sector for us to expand into, to ensure McVitie’s moments are open to all of our consumers with specific dietary requirements. Will these gluten free hobnobs be safe for coeliacs? Will they be as good as I remember hobnobs to be? We’ll have to wait until next month to find out! I might wait for others to try them before getting them myself. It’ll be great if they are truly GF as my taste buds are tingling and I could snaffle a Hobnob right now! How do they compare size wise against ‘normal’ ones? Are they smaller?